Rep. Kathy Rapp (R-Warren), Lt. 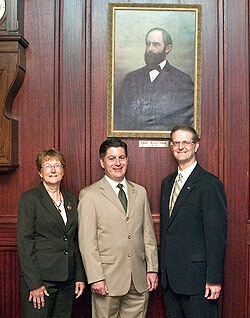 Governor Jim Cawley, and Sen. Scott Hutchinson (R-Warren) stand under the portrait of Charles Warren Stone whose lifetime achievements of public service, which included representing the people of Warren County as a state representative, state senator, lt. governor and U.S. congressman were officially recognized by resolutions adopted in both the state House and Senate this week. WARREN — On June 24, resolutions sponsored by Rep. Kathy Rapp (R-Warren/Forest/McKean) and Sen. Scott Hutchinson (R-Warren/Butler/Clarion/Erie/Venango) commemorating the life and achievements of Charles Warren Stone on the 170th anniversary of his birth unanimously passed both the state House and Senate. Born on June 29, 1843, Stone was elected to serve the people of Warren County in the Pennsylvania House of Representatives in 1869. In 1876, Stone was elected to the Senate of this Commonwealth where he served as chair of the Judiciary General Committee. As a lasting tribute to his accomplishments in the state legislature, Mr. Stone’s portrait still hangs in the Rules Room of the state Senate. Stone next moved on to the executive branch to serve as Pennsylvania’s lieutenant governor during the term of Gov. Henry M. Hoyt from 1879 to 1883. In 1887, Stone was appointed as Secretary of the Commonwealth and served in this post until his resignation to accept a nomination for Congress. He was elected to the U.S. Congress in 1890 and proudly represented his constituents on the national stage until 1899. After his retirement from the political arena, Stone returned to the practice of law and remained very active in his community serving as a director, officer or board member for several corporations and nonprofit organizations such as the Warren Savings Bank, Cumberland Railroad Company, Union Lumber Company, Warren County Public Library and as the first president of the Warren County Historical Society.